better access to front tank? Gentlemen… Thank you very much indeed for your comments and answers to my questions. I had no idea my rather lengthy list would get such considered or widespread a reply. I’ve added my own comments in brown and took an editorial liberty to add everyone’s initials at the beginning of each contribution to help keep things straight. Since Alastair email has been in the Whiffle I have also transferred his comments into the original. I even found a new question to add to the end. I couldn’t resist responding when I saw that you are from Thunder Bay. My wife is Thunder Bay born and bred, so we end up travelling there from Toronto to spend our Christmas and Summer holidays each year. I’ve wandered around the Marina park on a number of occasions and admired the variety of dinghies kept there. Thanks for your welcome to the world of Wayfarers. I have greatly enjoyed sailing W9657 since bringing it up to Thunder Bay and Lake Superior in mid-September and have only recently and regrettably put it away. It is quite a difference between it and trimming mainsheet on the 40 footer I often crew and race on! UA - I am happy to hear you’re enjoying your W even past the time when most of us far further south have already packed it in for the year. What enthusiasm!! TJ -Hear hear! Before responding I would advise get the free Pinell & Bax catalogue from England, even if you do not intend to order from them. It is free and available through their web-site (http://www.pinbax.com/). P&B specialize in dinghy parts and have lots of Wayfarer specials. The P&B catalogue has all parts listed with photographs which makes referencing them so much easier. And best part is that they list the manufacturer’s type numbers, which makes it real easy to order parts locally, Though I wouldn’t unless my local chandler is cheaper. I have had several very good experiences with P&B. AH- Thanks for the suggestion re: the catalogue… now watching the postbox. Vang, etc.… I’d like to alter the standard Abbott outfitting to route the lines out to the sides of the boat. The WIT sketches give some general ideas, but if there are any photos out there of boat interiors or installations that might show line routing, fitting placement, etc. of vang, cunningham, outhaul, spinnaker gear etc., this would really help sort out exactly where things should go. I’d like to drill as few holes as possible and unfortunately there aren’t any other Wayfarers up here in Thunder Bay to get a sense of the options and solutions and best place to locate stuff. UA - I would do this on my boat but mine is wood and - while the principles remain the same - you will have to adapt them to a Mk III. I have no useful photos in that regard. Our best racers that sail a Mark III are Brian Jeffs and Scott Bamford who sail W9235. I will copy Brian on this email (don’t have Scott’s email) and perhaps they could either give you Mk III-specific advice or/and pictures of their W? AR- The standard Abbot vang is too underpowered. I replaced it with one of the Harken systems which give a good 15:1 purchase. With that baby I can get a tremendous amount of pressure when needed. Similarly, Abbott does not ship the boat with a Cunningham eye system, which should be added. All my mainsail tension adjustments (vang, Cunningham, outhaul) terminate near the mast - maybe not ideal, but I tend not to fiddle with them too much unless the wind is extremely variable. The one I do adjust most - the vang - is the easiest of the three to reach and adjust anyway. AH – Brian did respond… thanks Brian… they rig the vang out to the thwart. I’ve looked through some regatta reports and found a few pictures that give some hints of fitting placement, but if anybody has rigging / boat interior pictures that would indeed be helpful. BJ - As far as the vang goes we lead our back and secure it along the thwart on both sides of the boat. It can be a problem during a real blow when trying to make vang adjustments from a fully hiked position. It came to us this way and we have never bothered to change it so it leads more outboard. Bill Abbott might be able to give you some advice if you're going to be speaking with him. TJ - I have copied the design with the two three-sheaved Harken blocks from the WIT site. It works OK but if I were to do it again I would certainly use a SS-wire cascade system. A Cascade system is much simpler and more important, much cheaper. The Harken three-sheave blocks are very, VERY expensive! (BTW P&B have a SS cascade kicker system for the Wayfarer on stock). I have also looked at the lever system like the one Al is using. Though I am sure Al will have another opinion, I don’t like it because you always need bungees to keep it where you want it and its effective adjustment range is limited. You need to tweak it all the time. And also I think it is a pain in the ... if you go cruising. My experience is that when you reef the main, the kicker needs either a good range of adjustment or it must be easy to adjust its effective length. And for reefing while sailing it must be easy to unhook quickly and re-attach quickly. That is why my kicker has a (very strong) carbine hook near the mast. AH – At present I’ve got the original Abbott 3:1 or 4:1 vang cascaded off a small block on the boom tang for a 6:1 or 8:1. I think I’ll rerig it over the winter so that after it is brought to the side decks it will be a 16:1. The lever looks pretty neat, but I think I’ll stick with a revised block/ cascade idea at present. UA - Re: the lever system - I’m used to mine which works superbly. Other than the Laser vang which I used 1964-1975, this is all I’ve ever used, so am not good for comparison tests. Agreed that adjustment range is limited, but if you start with the right length, it never needs further adjusting. True, it requires a bungee to make the lever stand up straight, but once it’s set up (ours has a loop in the bungee that goes over the gooseneck wing nut), it’s a two-second job to hook it up for the day. Can’t comment on the reefing, having never done so. I have nothing against reefing. But it’s been my experience with the cruising I tend to do which is a series of day-sails as opposed to several days at sea, that I can vang the heck out of the main and then spill wind as necessary for a relatively short trip like across Lake Champlain to the nearest bar. Off the wind - reaches are no problem and if the run gets too nerve-wracking, I go under jib alone. And if the wind gets consistently over 25 knots, most of us wait for a more relaxing set of circumstances. Not sure why Ton wants an easily unhooked vang - lightbulb!!! you’re talking about roller reefing, aren’t you. But if so, what to you do about your mainsheet? TJ - No, I use slab reefing but if you reef while sailing the crew (at the mast) first takes in the leech. This raises the boom and that is only possible when the kicker/vang is unhooked, unless there is a heck of a lot of adjustment range but, to my knowledge, no 16:1 system has that much adjustment range. The boom end is raised well over a yard up, to the first reef. Then, after cleating the leach reefing line (there is a cleat on the boom to do that), the crew (still at the mast), lowers the main sail until the reefing cringle in the luff is about 3 to 4 inches above the boom. This brings the boom back in its horizontal position. Next the crew tensions the luff with a reefing purchase on the boom and cleats it on a purpose cleat on the boom. (I use the cunningham purchase that doubles as a reefing purchase). Finally the kicker is hooked to the mast again and is tensioned. Change the order and the boom will end up in the cockpit where the helm will loose all control over the main sail. AH – Interesting…. big boat reefing (at least the one I crew with) is the reverse…. Drop the main halyard to fix the new tack cringle, ease vang and main in order to tighten the clew down with the reefing line, and retrim vang and mainsheet. We have a strut type vang however to hold the boom up and reefing is done on the go, but the order does stop the main thrashing about with a really tight leach. TJ - In my case there is an extra twitch, I followed Ralph’s (Roberts) advice and made a reef that is not horizontal. When reefed the boom end is about 4 - 5 inches higher than normal. Since I am used to the normal boom height, this extra head clearance is just enough to avoid hard encounters with the boom in rough weather. However, my 1:16 purchase does not have enough range to cope with the extra 4 - 5 inch. This is why I made a second kicker tang, slightly above the original tang, on the mast. This is another reason I need to be able to undo the kicker, it has to go to the other tang. I’m thinking to bring the lines along the underside of the thwart, up through it at the outer edge, and have them cleat along the vertical support ‘bracket’ that joins the thwart to the deck. I am unsure if this location might present problems compared to elsewhere on the thwart, but inboard locations would seem to have more difficulty in making adjustments when sitting out. UA - Sounds good to me. Perhaps Brian could comment? AH – They route just to the back of the thwart. TJ- Hmm, every sheave introduces more resistance. My approach would be "keep it simple". Also have a look at the direction you are pulling when hiked out. I think that the lines attached to the centreboard case or to the floorboards near the centreboard case save you a pulley and the pulling direction is better from the hiked position. A cleat at the back of the thwart is already in the natural pulling direction, making it much easier to cleat and unclear the control lines. Though more expensive, a good alternative is a HA4771 through deck lead with cleat. It allows you to lead the control lines through the top of the thwart. Another alternative is what is done on the Wayfarer World, a recess in the top of the thwart that is a sort of a bay for the cleats, In the upward wall of the bay a fairlead lets the control line pass through the thwart. It needs some polyester work but it looks nice. Personally I like to keep the top side of the thwart clean. It is so much easier for my crew to slide her behind over from side to side. (Any obstacle on top of the thwart would certainly jeopardize my marital life in more than one way ;-). AH - I still rather like the idea of having at least the vang cleat on the vertical support bracket as this would seem to fall more to hand than a thwart location when sitting out. Tons suggestion of routing lines up at an angle from near the bottom of the centreboard case to the side of the thwart is a good idea – thanks. I don’t have a HA? Holt Allen ? catalogue but I think I see what you were suggesting. At present I am thinking that the vang will go to cheek blocks on the mast support, low along the centreboard case tuning upwards to an outboard exit block under the thwart leading to a small cam cleat on each thwart support bracket. In comparison to cleating directly on the thwart rear edge, the exit block should add only a manageable resistance from the angle change. So the vang will cleat up along the support… anything else; outhaul, etc., will parallel the vang routing but go just to the back edge of the thwart. I was wanting to install a compass in the centre of the thwart….. but I wouldn’t want to similarly jeopardize anything :-) … is there a better compass location? I’ve also had trouble finding in fitting catalogues the cleat that holds a spin sheet down as a guy. Or should I forget that and go for the ‘balls system’? UA - Having sailed a couple of windy races in Tom Wharton’s W600 which has the old clam cleat system, I would never go with anything but the "Balls System" again. Peter Rahn (copied) should still have some of the appropriate sheet rope for that system which is otherwise hard to get in Canada. If you figure the clam cleats are good enough for now, I might be able to dredge some up in my box of old gear. Let me know. even when sailing. Don’t bother with a block on the end of the barber hauler. Use a SS ring. A block gets quickly too heavy in light weather. And lets be honest, what could fail on a SS ring? UA - My tiny Harken mini-block (smaller than the 082) weighs less than a stainless steel ring - at least the kind I would use??? I used to use a plastic ring but it got chafed. We actually have no trouble with block weight in light airs (in which we do very well!). BJ - As for the spinnaker guys, we have a twing/ball system and a cleat. Abbott has the appropriate cleat. We definitely prefer the twing/ball system. AR- I’ve got to re-examine that system. I’m using the standard Abbot spinnaker system and it is less than wonderful. I ended up replacing the Abbot spinnaker pole uphaul/downhaul. I inserted a mast sheave and ran the spinnaker topping lift back down inside the mast, bringing it out about 1 foot above the deck, down through an eyelet to a block and cam cleat near the base of the mast at the front end of the centreboard case. For the downhaul, I used shockcord which runs from the front of the mast (under the deck) forward to a little block tucked under the bow, back to the mast then, via blocks, up the the pole fitting. To my mind, this is cleaner than the (standard) way of running the shockcord aft along the cockpit floor to a fitting on the aft bulkhead. AH- Although the old system would indeed probably be good enough (actually the boat has virtually nothing in the way of spinnaker rigging), "Balls" it shall be. Thanks. I do have to agree that the boat is woefully under-prepared for spinnaker work. I like Alastair's shock cord idea. Are the standard factory issue spin sheet fairleads taken off and replaced with a pulley through the deck, or retained just ahead of it? UA - I don’t understand what you mean here by "standard ... fairleads"? AH- The boat has these small plastic fairleads like an eyestrap on the top of the deck near the aft bulkhead … presumably for the spin sheets. Any photos I’ve now seen show a deck sheave here…without any fairlead in front… so I guess that’s the answer to the question. TJ - Are you referring to the through deck sheaves near the aft bulkhead? AH - Yes and no as noted above… at present I don’t have deck sheaves… any particular recommendations? TJ - A turning block on top of the deck is also fine. This is how the World has it. A World cannot have a through deck sheave for it would go into its buoyancy compartment AFAIK. Anyway, it depends on how you plan to lead the lines through the cockpit. AR- On my boat, Abbott installed a couple of quarter blocks. The sheets went through these to through-deck leads and re-emerged at the thwart bracket. I since removed the quarter blocks and now just take the sheets directly through the through-deck fittings. AH- I’d also rather keep the deck flush than have a turning block. I was thinking of returning the lines from the deck sheave along under the side decks to near the bottom of the thwart support and have an exit block there with a camcleat just at the outer edge of the thwart. Any comments/ other suggestions? I still kind of like the traveler, (keel boat familiarity perhaps) but the simplicity of the bridle is appealing. UA - It most certainly is! TJ - A traveler does not allow you to sail with a fixed trim. Sail trim will depend on the boom angle relative top the centreline. The idea of the bridle is that the vertical boom position is defined by the kicker only. The sheet has, thanks to the bridle, no influence on the boom height. In other words, the kicker is for trimming and the sheet is for sailing. It makes life so much easier compared to the situation where you constantly need to tweak things in order to keep the trim constant. BUT!!! you need a strong kicker (16:1 or stronger) and a very stiff boom (Proctor 2628 or better 2633, the latter is the standard boom that Porter’s is using on new boats nowadays). UA - I know that the UK guys tend to take the bridle length to extremes - the ideal being, as Ton suggests, that the bridle centres the boom without downpull on the leech while the latter is provided by the vang (kicker). My problem with this is that it requires constant bridle adjustment since vang adjustment will require bridle adjustment - more vang means the bridle is too long and the boom can’t be centred, etc. We tend to sail in variable winds most of the time, so I prefer the shorter bridle which never has to be adjusted and I never use the vang upwind until we’re overpowered. This gives us pretty well the best performance and allows me to play only one item: the mainsheet. This in turn lets me concentrate on more important stuff like waves and the other boats. TJ - That is what I meant to say, I have yet to use the bridle adjustment on my boat. UA - No! I believe both of the gentlemen (Al's note: Peter Rahn and Brian Jeffs) whom I have copied here, go with a split mainsheet that does a similar job to the bridle. Also you can go with the traveler. BJ - We run a split mainsheet rather than a traveller. We started with a traveller and found it a real pain to deal with. We found the traveller to be advantageous in very limited conditions. TJ - I can adjust my bridle in such a way that it becomes virtually impossible to oversheet in the heat of the battle. This idiot proof blockage is not present in split rope systems. Otherwise I don’t see much difference except that a bridle is easier to make than a split rope, but then again others claim the opposite. UA - My worry about the bridle is an inability to sheet in enough! Re: split mainsheet - one matter to keep in mind with the split mainsheet is that you get less purchase - 2:1 instead of the 3:1 that I have or more. TJ - I have copied an idea from a chap called Al Schonborn ;-) (Al's note: photo of my boom end arrangement below) and that is to have a carabine hook at the sheet’s end. In light weather, the purchase is quickly reduced from 3:1 to 2:1 by unhooking the carabine hook at the boom end. This means you have much less rope to pull in or let out and a more direct feeling. or is there a better way to route traveler lines to be able to completely adjust from the windward side? UA - There probably is but I don’t know it. 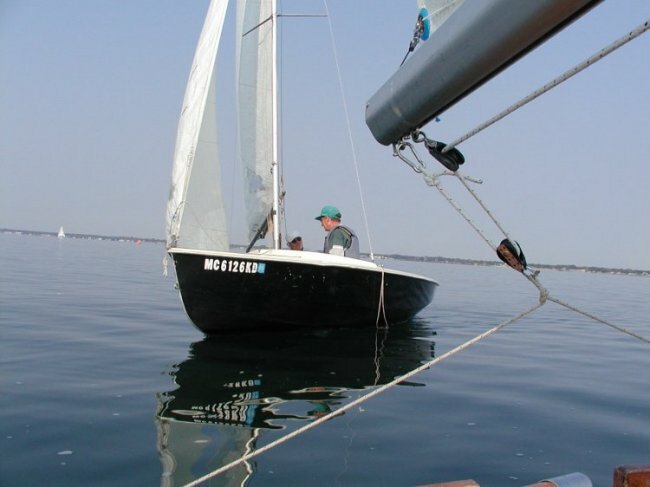 Over the years, I have found that fiddling with a traveler tends to distract me from more effective uses of my racing time such as concentrating on sailing the boat and on the competition. I used to bring the traveller to windward to reduce main leech tension upwind in light airs but found that it didn’t seem to improve performance and also would screw me up at the most crucial times: I especially remember the last time I ever sailed with the traveller to windward (in ‘76, I believe it was). We were drifting in towards the finish line on port, on a collision course with two starboard tackers. We decided to tack to lee bow the other two. Having left the tack to the last legal second, my wife and I had to make a quick and perfect tack if we were to have any hope of beating the other two. With the traveller needing to end up to windward after the tack, I tried letting it off to the starboard side of the boat and cleating it there just as I put the helm down. Of course, it didn’t want to cleat and I ended up with a traveller that was right to leeward and a main more or less out for a reach. When I subsequently had to go to the "high side" to re-do the traveller, the wind got spilled from the main and jib again and we basically lost all hope of beating the other two boats. Since then I have found it far more peaceful to sail with a system that never needs adjusting. The adjustable bridle - no matter how hard I have tried, seems to come uncleated at the worst times (e.g. with two seconds to go to the start), and so I have abandoned it, also! TJ - I couldn’t have said it better, Al. AR- I’ve kept the traveller on my boat. My preference is because I sail with my sons, so our weight is somewhat less than a crew of two adults. The Wayfarer being what it is - a boat with a reasonable amount of sail area - we often have to de-power a lot earlier than most crews. This is where the traveller comes in - I usually ease it out and sheet in hard. This controls the twist at the top of the sail while at the same time bending the mast to flatten the sail. It also has the benefit of opening the slot between the main and jib and reducing the backwinding effect. Also, when sailing tight reaches or full&bye in moderate conditions you again have the benefit of more control of the upper parts of the mainsail. However, listen to Al - he’s winning races while I’m not! I’m a bit puzzled as to the advantages to the adjustable bridle shown in the WIT. AH- Wow…now that’s a discussion…. thanks. The traveler does have a tendency to being caught up on the wrong side or uncleat inappropriately. It’s a nice sail control on a keel boat but sure can seem to be a pain on a dinghy at times. I was a bit hesitant to give it up but a bridle it shall be. Is it correct that the bridle length can be set when the block just reaches the keel when pulled downwards? If a fixed bridle is used how / where are the ends attached to the transom corners? UA - See http://www.angelfire.com/de2/WIT/98Bridle.htm in its new format. UA - Good idea! I used to have something similar but succumbed to the lure of "lighter ends"!!! AH- Horizontal holes and shackles through the traveler rail…brilliant idea …. thanks Ton. That solves that problem nicely… without having to sacrifice the entire traveler installation or drill more holes into the boat. TJ -This reminds me of the time I received a free self-adhesive tape measure (from an ad campaign by some chandler). I decided to put it on the most visible place on the boom, and when someone asked I had a real good baloney story ready. It took the rest of the fleet less than two weeks to glue tape measures on their booms too... After which I took mine off of course (you never look at the dam things anyway). It was great fun! For jib halyard tensioning, I am leaning more to a cascade system that could be led to the boat sides than a mast mounted magic box or lever system. Would there be problems with having halyard forces pulling aft from the sheave at the mast bottom instead of upwards? Extra lower mast bend perhaps? Any options / suggestions? UA- The cascade system sounds fine - or a couple of triple blocks (ask Peter Rahn how he does his? ), but I would say that going out to the sides with this would be unnecessary since the jib halyard rarely needs to be adjusted while hiking. If you have a mast with a heel plug designed to go into a track, you can block that track by putting a (quarter-inch?) pin through it aft of the mast foot. I believe that’s what the many people - especially in the UK - do to counteract excessive lower mast bend - unless of course they want to promote pre-bend for light airs. TJ - New boats by Proctors have a cascade system mounted left and right of the CB. With new masts (sheaves at the bottom) muscle boxes go best on top of the CB box as well. Though expensive, muscle boxes are tidier than a cascade system. But from a cost perspective I would go for the cascade system. Unless you have too much ballast in your wallet, forget about any solution involving triple sheaved blocks. For that kind of money I would rather have a muscle box and fewer ropes around that always get entangled when you least want it. AR- I got Abbott to install a magic box. They installed it on a specially mounted bracket on the starboard side of the centreboard case. If your mast foot is like mine - a slot open towards the bow, but closed at the stern, then the pressure of the jib halyard tension will jam the mast heel hard against the back edge of the foot. In this case, I do not expect that mast bend - beyond what is normally attributed to tensioned jib luffs - is induced by this arrangement. AH- Taking the jib halyard adjustment out to the side idea came from some Albacore rigging information - that boat apparently is very sensitive to halyard tension. Perhaps it is not so necessary with a Wayfarer, but I’d like to have some means of adjustment in a more convenient location than the original mast cleat. I have a mast heel tenon/plug but no existing plug track at the mast step…. it all hangs from the pivot bolt with just light contact to a flat metal plate at the step. This mast step restraint variability is a bit confusing … although I don’t have one, I’d still like to pull straight back from the mast bottom sheave to the c/b case with a cascade for the halyard. As Ton suggests new boats already do this or achieve it with a muscle box…. maybe though these new boats have a mast step? I need to give this one more thought, or find a mast step. I now also understand that Abbott’s can supply a mast step. Do fittings/ screws/ bolts etc., hold okay in the existing fibreglass thickness or do they need backing plates?… how thick is the fibreglass around the centreboard case for screw attachment of cheek blocks etc.,… any precautions I should take? I appreciate that Shades is a wood boat but any advice on glass installations would be welcome. UA - I’ve done some installation on glass boats but really don’t feel qualified to say. You might try phoning Bill Abbott (jr.) at (519) 542 - 2771. TJ - I would use bolts and nuts and a backing plate for anything that needs to handle some force or dynamic loads. Lighter stuff can be fixed with self-tapping screws but I feel better when they can bite in a little more ‘meat’ than the 5 or less mm of GRP. A small piece of ply usually fits the bill. AH- I spoke with Bill Abbott (sr.) Backing plates recommended although lighter fittings in shear loading rather than tension should be okay. I’d like to add an ‘uphaul’ line for pulling the rudder up when approaching shallows without having to lean way out over the stern to grab it. UA - I think you might be making things a bit more complicated than necessary? We just let our (good racing) rudder blade hit bottom and kick up - unless that bottom is rocky, of course. Of course, the wood blade (with glass cloth epoxied onto it for extra strength) stays up - don’t know that the glass blade will do that? If shallows are a regular problem where you sail, it might be worth all the effort? TJ - A Wayfarer rudder floats and when the bolt is adjusted well it will come up by itself or it is pushed up by the bottom. The biggest problem is to keep it down. However, if you want a downhaul, make sure it does not prevent the rudder from coming up when you hit bottom. Use bungee or one of those auto release cleats. UA - I’m not at all sure that Abbott’s glass blade floats!!! Want to do an experiment for us, Andrew, next time you’re in someone’s hot tub? Think of the conversation starter this would be!! AH- They would still be talking!….. glass seems to sink. The rudder will not likely come up by itself. Could I just drill a hole in the top aft edge to attach a line that would help lift it up? UA - Your mechanical advantage won’t be very good, will it? AH - True, but still maybe easier than leaning over the stern to attempt to grab the rudder. Lake Superior is cold….and rocky! It is an original factory fibreglass rudder … are these wood cored?... I’d like to not hit that with the hole. Can the original factory centreboards be improved in any way - better fairing? …. trailing edge thickness? What type of resin (epoxy or polyester) should be used to repair small dings? TJ - I have seen a glass rudder made by Porter’s. Trust me for any serious racing you want a plywood rudder and not a piece of ‘rubber’. Get the drawing from your association and spend some nights during the coming winter making a new rudder (we haven’t got anything else to do anyway). Finish it, like Al said, with epoxy and glass fibre, it will be stiff and will last for many years. AH - Galls rudders and c/b’s are apparently foam cored, but are solid fiberglass near the edges… so if I am careful… the rudder hole should be doable. Are these drawings available Al? It will cut into my x-c skiing time but might be worth it. UA - You should be able to get one from our Chief Measurer, Len Macdougall. Although the Wayfarer is promoted for racing and cruising, the Mark III disappointingly comes with only a small inspection port in the front bulkhead. It does have a shelf above the buoyancy tank but it would be much more stable, drier, and logical to put a few things (tent, limited camping gear) lower down in the boat and inside the tank as can be done with the Mk1. I’d like to install a larger - say a 10" round inspection port in the forward bulkhead wall for this purpose. However Rule 21.3 seems to restrict opening size to 6¼" max. It baffles me as to why the bow storage tank in a glass Mk I can have a rectangular 1’8" x 12" opening but a Mk III nothing bigger than 6¼" dia. Can you offer any insight into this? What are they worried about? Improved tank access into a Mk III wouldn’t affect the speed or security of the boat, particularly given the layouts/construction of previous Wayfarer marks. This limitation certainly doesn’t facilitate using the boat for cruising as the class design was intended and promoted to do and almost seems in opposition to Rule 1.1 and the Constitution 3.1(a) To…. preserve the original concept of the Designer, i.e. a simple multi-purpose craft, suitable for cruising as well as racing. Why would reasonably making my Mk III more suitable for cruising by adding a larger inspection port make it not a Wayfarer or suitable for racing? If I improve access into the front tank, will I have measurement problems should I make it down for the World Championships as I hope to do? UA - Why not check with Bill Abbott? If he does see any safety concerns, then I’m sure that we (the CWA) could give you a dispensation or better yet let you be our official "guinea pig" who could then report your findings and we could see if a rule change should be made? Meanwhile, I’ll add you to our list of possible Worlds entries on our Worlds site. It’d be great to have you with us, Andrew. AH - I talked with Bill Abbott (sr.) - the designer of the Mk III. …. there isn’t a problem from either a structural or safety concern with a larger access hole into the front buoyancy /storage tank. If I understand him correctly the original thought was to utilize a small opening that would slow down sinking in case someone forgot to close it and dumped. The other concern appeared to be that really large hatch covers might be unreliable. However all Mk III’s then went on to be built with permanent foam floatation also installed in the tank which makes the provision of only a small opening now rather redundant in the event. So in short, a larger and more useful access into the front tank is not a problem from the boat designer’s perspective. Where to from here? I’m certainly interested to try this but sure don’t want my Wayfarer to not be race and measurement acceptable. The next logical question is would the CWA be willing to examine (ideally change or at least allow exemption from) a rule that seems to have originated out of a solution to a non-existent problem?…. i.e., you only need a small access hole to slow down sinking if you don’t have permanent floatation (and decide to leave access hatch covers off !). There is an obstruction interference with the seat support that limits the size of an opening to about 9" to 10" dia anyways so it’s not like I’m looking for a whole lot larger than the 6¼" max opening now allowed by the rules. However 6¼" is really useless in comparison. Reliable hatch assemblies are available in these larger sizes. The new modified rule would allow a bigger opening say 10" dia. as long as there is permanent floatation installed and maintained. My position would be the access opening restriction in the MkIII is without safety or structural foundation (backed up by discussion with Abbott) but does unfortunately limit gear storage and detracts from optimizing the MkIII to the original Wayfarer concept of a combined cruising/ racing boat. A rule modification to allow a larger access hole size should be allowable as long as there is permanent floatation maintained in the front tank. This would improve suitability for cruising but obviously have no effect on the boat's racing performance. TJ -- Have you ever peeked inside the tank? The keels come up and the sides come inward. Then there are the foam blocks, there really isn’t much usable space anyway. AH - True, there is not a lot of room with the profile of the bottom of the boat hull and the foam floatation, but there is some room… and ideal for putting a few things such as a tent, tarp, spare rope, spare anchor, etc., into. Gear that you don’t need access to until ashore or anchored, and is useful to have as low as possible in the boat. The really small access opening restriction serves no real purpose and yet negatively impacts the boats potential capability. If it could be better…. why not? Most people probably won’t even bother … but it should be permissible to do so. Some MK1’s have a double hatch but the owners never use the lower hatch and are reluctant to use the upper one for there is always lots of equipment in front of it. The open shelf above the tank in a MK2 and MK3 is really the most practical solution IMHO. Though the back tank is the worst place from a weight distribution viewpoint, it is the most favourite dry storage place on a Wayfarer. UA - Not sure how much of this applies to the Mark III - most of it, likely! AH- The open shelf is very useful but it does require weight to be higher up, waterproofed, and restrained from movement and loss. I’ll certainly have gear here, but would also store some equipment as noted under the shelf (better stability, ‘dry’, and lightens the stern). Hatch accessibility in a Mk III would be better than most since the ‘Vee’ shape of the front bulkhead forces the opening to one side of the mast. UA - If you're really keen to make this change, send us an official request and I'm sure we can get you a dispensation as our "guinea pig". No point in changing the actual Rule until it's been tried out??? While commenting /ranting on the rules, my used but ‘from the Abbott factory’ Wayfarer does not come with a full-length keel band as mentioned in 11.4? Does it not meet the class rules? UA - We’ve given up arguing with Mr. Abbott about this. He figures they’re unnecessary sources of holes, etc. That rule is studiously ignored when it comes to Mk III’s. TJ - You may want one after you beached her for the first time. UA - If so, extra stripping is available through Abbott’s. AR - If you add centreboard slot closure strips, you’ll have to fit additional bands on either side of the centreboard case and maybe for 6" aft of the case. AH - a bit surprising, but thanks for the clarification on this. If the centerboard bolt gaskets leak at all in a Mk III, water accumulates in the floatation space beneath the cockpit floor and is a pain to get out. I’d like to drill through and install in the aft bulkhead at a level below the cockpit floor (i.e. just above the bottom hull of the boat) a small plug say ¾" dia (using a plug like the expansive rubber type used for fishing bait wells or the existing rigid floatation tank drain plugs at the sides of the stern storage area). When the boat is tilted up on the trailer, the plug can be removed and the water drain from under the cockpit floor into the stern storage compartment for easier removal. Any thoughts on this? It doesn’t appear to me to compromise anything or break any rule (20.9a seems to approve). 20.8 In the aft bulkhead. (a) Not more than two drain holes, each of maximum diameter 1" (26), below the level of the cockpit floor. But I’d check with Abbott, also. Moreover, in a recent discussion (see http://www.angelfire.com/de2/WeeklyWhiffle/WW031027.html), Bill Abbott has made it quite clear that such leaks should not be happening. So, prevention might be the best approach - certainly the one I’d choose. TJ -- Hear hear! Solve the problem, don’t fight the symptoms. AH- Sorry about the research Al :-) also for the typo as rule 20.8(a) was indeed the one I meant. Bill Abbott didn’t have a problem with this idea. I agree a cure at the source is preferred (although all appears ok there on initial inspection)… but this drainage plug option would be a convenient backup. UA - Sounds like a wise plan! AR -Something else you should consider: the MkIII has a terrible centreboard case. It is quite wide at the bottom and the board is not braced at its pivot point. You’ll have probably noticed that if you are out in a chop with little wind that the board rattles around quite a bit. Some of my performance woes, I’ve come to suspect, may originate from that area. I believe that, in a breeze, the board torques in the case. The effect is to angle the board so to promote more slippage to leeward (with the pivot point at the front, the sideways pressure pushes the aft end of the board to weather). I’ll be spending part of this winter trying to address that problem! AH- Thanks for the heads up Alastair. I’ve a suspicion that it could be tighter as it does like to vibrate a bit when the boat thinks about planning. Perhaps that’s the trailing edge though that could use some work…. If you find a good solution I’d be interested. UA - I don't know about the centreboard situation: Two of our best racers, Scott Town and Brian Jeffs of London, sail Mk III's and seem to like their CB arrangement just fine - and they're the type that would complain if it wasn't acceptable. I'm not quite sure, Alastair, what the problem is that you refer to: Is the actual opening in the hull wider than you'd like or do you feel that to the box is too wobbly? If it's the latter, it's good to remeber that the pivot bolt is very close to the hull and won't wobble much, and the other end of the box is attached to the thwart, so your board shouldn't suffer from excess "play". And finally, the battens I have seem rather narrow … the top is about ¾" wide and looks about right, but the lower three are much narrower... about 3/8ths" …. is this the norm? UA - This varies from sailmaker to sailmaker - we’ve used both widths and noticed no advantages either way. Is there a specific recommendation for width, thickness/ stiffness of Wayfarer battens? Sorry for all the questions… prowling around the TS&CC boat park could probably answer many, but that’s 1400km and the wrong season away. Your advice and help would be sincerely appreciated. UA - I’m hoping this helps - a bit, at least. AH -- It does … thanks very much. UA - And I also hope that some of the other guys will see fit to contribute. Too bad you’re not closer, because we sure could use more people with your enthusiasm around here! AH- Thanks Al and Ton, Alastair and all who contributed to answering my questions. I sure appreciate your time and thoughts. And if anyone does have a photo or two that happens to show setup or rigging on their boat that would sure be appreciated. I do hope to be able to make it down in August 94 for the Worlds… it would be an amazing opportunity to follow some great Wayfarer sailors around the race course…. unfortunately the gap will be rather large. I do have to say after looking through a number of other dinghy class web sites for inspiration and ideas that the Canadian Wayfarer site is far superior to most for the information it contains - the technical and rules sections appear unsurpassed. Well done. PS: A question I overlooked (hard to believe!) is the position of the jib sheet fairlead tracks. Is there any Rule (sorry again) or generally accepted best spot regarding track position? Mine run down the centre of the outer plank of the two making up each seat. Consequently the camcleat position falls over the gap between the planks. The fairlead/ camcleat assembly is a Holt Allen model with everything mounted on a flat metal plate. Some metal bending and rearrangement is planned to raise the cleat above the fairlead and improve the angle and ease of cleating (at present the crew does a lot of cursing and has to use their foot to push the sheet downwards to engage the camcleat). However the plate will then need support from underneath so as not to be flattened again when it inevitably gets sat on. Before I get too inventive ... is the jib sheet fairlead track in the right place? …. moving it inwards about 3" to be on the outboard side of the inner plank would allow support from the plank rather than dealing with the gap between them. The WIT discusses this but various pictures indicate tracks in a variety of locations. Is there a rule, a downside, or other benefit to moving the track to a more inboard sheeting position?